There are several built-in functions. In this video session, we will look at the most common string functions available. 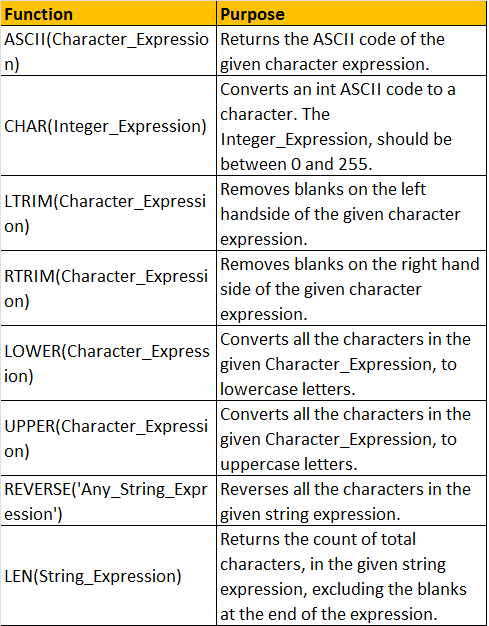 ASCII(Character_Expression) - Returns the ASCII code of the given character expression. CHAR(Integer_Expression) - Converts an int ASCII code to a character. The Integer_Expression, should be between 0 and 255. Note: The while loop will become an infinite loop, if you forget to include the following line. Another way of printing lower case alphabets using CHAR() and LOWER() functions. LTRIM(Character_Expression) - Removes blanks on the left handside of the given character expression. Example: Removing the 3 white spaces on the left hand side of the ' Hello' string using LTRIM() function. RTRIM(Character_Expression) - Removes blanks on the right hand side of the given character expression. Example: Removing the 3 white spaces on the left hand side of the 'Hello ' string using RTRIM() function. Example: To remove white spaces on either sides of the given character expression, use LTRIM() and RTRIM() as shown below. LOWER(Character_Expression) - Converts all the characters in the given Character_Expression, to lowercase letters. UPPER(Character_Expression) - Converts all the characters in the given Character_Expression, to uppercase letters. REVERSE('Any_String_Expression') - Reverses all the characters in the given string expression. LEN(String_Expression) - Returns the count of total characters, in the given string expression, excluding the blanks at the end of the expression. In the next video session, we will discuss about the rest of the commonly used built-in string functions.